This mod is my first mod published, so it will probably seem boring and simple. 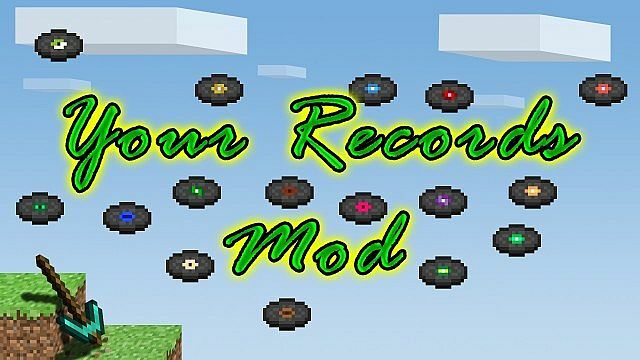 Basically, this mod allows you to add your music into Minecraft using custom added records and also keep the default records. It also includes some decoration blocks that are powered by redstone. This mod was requested by one of my friends, so I decided to create it for them and then uploaded it to see what others think. Do not worry if you don't want others to hear your music, the record data is client side and they will only hear their songs. To share the same songs, make sure you both have the same music files and named the same. If you have my permission to use it in a modpack, make sure you do not distribute copyrighted music! This mod includes some higher resolution images than default. 1). Download and install Minecraft Forge for 1.6.4 (http://files.minecraftforge.net/). 2). Unzip the mod file and put files into "mods" folder located in the ".minecraft" folder. 3). Convert your songs into a ".wav" format and rename them to "Record 1" up to "Record 16". 4). 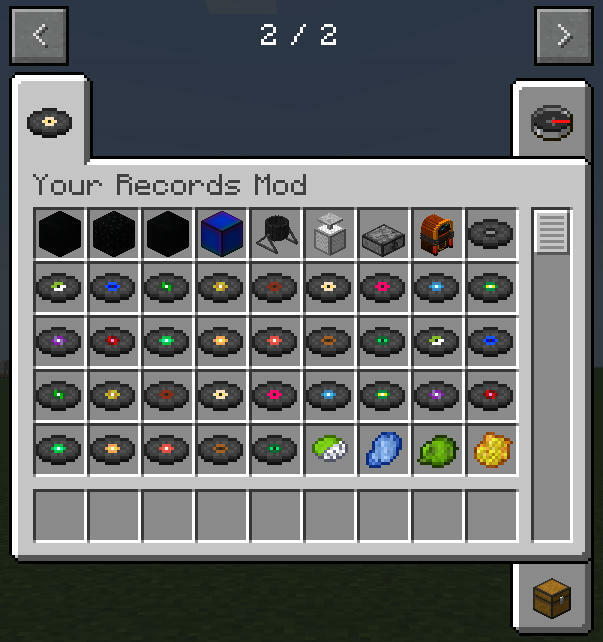 Go into the mods folder and open the mod, go to "assets\recordsmod\records" and paste the songs. 5). Play the game, create the discs and you should here music! 2). Download and extract the mod. 3). Convert your songs into a ".ogg" format and rename them to "Record 1" up to "Record 16". 4). Open the jar file with WinRAR and paste the songs into the following directory: "assets\recordsmod\sounds\records". Sorry if this is confusing, the video should explain it much better. 2). Download the mod and the songs you want. 3). Convert your songs into a ".ogg" format and rename them to "Record 0" up to the value in config, default is 32. 4). Open the jar file with WinRAR (or similar) and paste the songs into the following directory: "assets\recordsmod\sounds\records". 5). Play the game, craft the discs and you should here music! Sorry if this is confusing, the video should explain it much better (A video will be uploaded.....eventually.......Soon™). To change the amount of records, go into .minecraft and locate the config folder and open it with Notepad++ (or similar software). Then change the number to anything under or equal to 128. For servers, it is recommended to leave it at 128. If you have played YRM with a version below 0.9, then you need to go to the config and where it says use old names, put true. What is going to be added? I think I will do one more last big update to v1.0 and then leave the mod as it is, so it will just be Minecraft version updates in the future unless I get a lot of requests for more stuff. I plan to update all of my mods soon to version 1.8+ of Minecraft. This is for the latest version! Above shows the items and block this mod adds. The text below will describe what you can do with these and what they are. The blank records and dye mixes are used for crafting recipes. You can find the crafting recipes under this section. 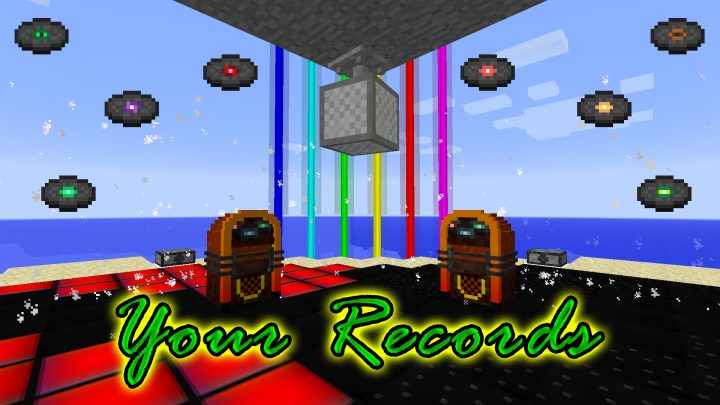 The custom records are the new records added in the game which can play your music files. When you run the mod, many of these items are generated, the default is 32. You can change this by going to the config and changing the number of records to generate. The max is 128 in version 0.9. Each record has infromation displaying which record sound file it is connected to, e.g Record 0.ogg is played via Record 0 in game. The records can be played in a standard jukebox or the custom one, more on that below. If you right click the record without clicking on a block, it'll bring up the interface as show above. Here, you can write a new name for the record. The text you enter will be applied to the record when you hit update, this allows you to call the record after the song name. When played, it will also display 'Now Playing: x' where 'x' is your record name. The image above shows the Twinkle Floor block. 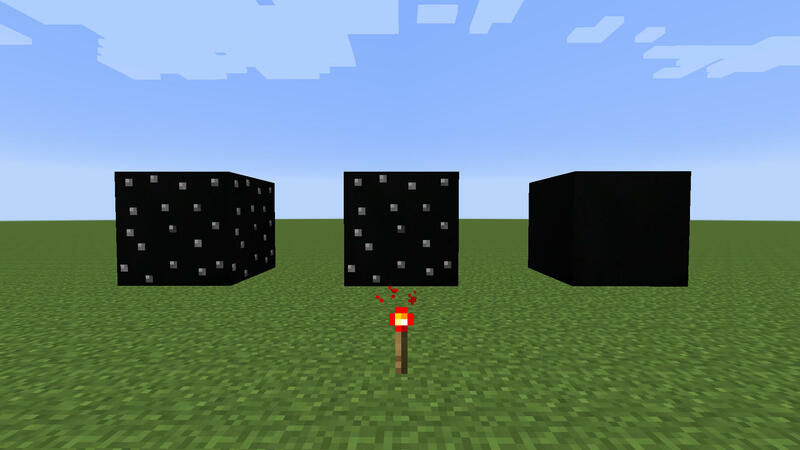 The block on the right shows Twinkle Floor when no redstone current is applied, the middle block shows Twinkle Floor with power. On the left is the Powered Twinkle Floor block which is always powered no matter the redstone supply. This is a decoration block and can be used as a dance floor. The image above shows the Colored Floor block. The block on the right shows Colored Floor when no redstone current is applied, the middle block shows Colored Floor with power. On the left is the Powered Colored Floor block which is always powered no matter the redstone supply. This is a decoration block and can be used as a dance floor. 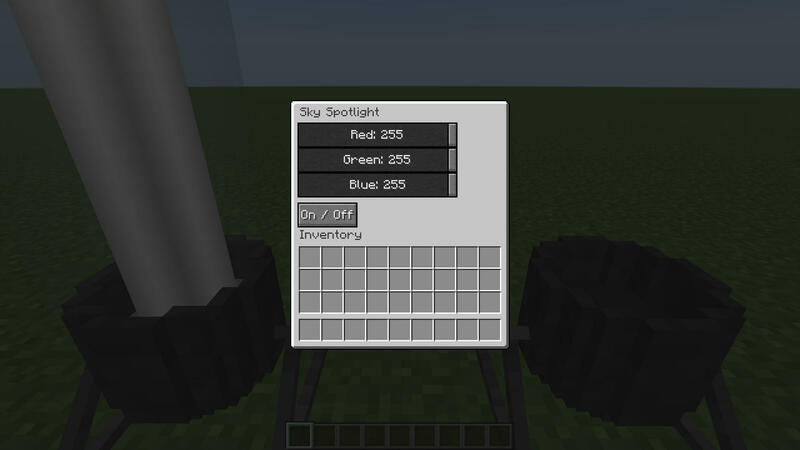 The above image shows the sky spotlight and graphical user interface (GUI). You can toggle this block on and off using the button in the GUI. When on, the Sky Beam will shoot a ray of light out towards the sky. It will go up to 256 height or if there is a solid block in the path. The GUI also had three sliders, each for the color of red, green and blue. This allows for a combination of up to 16,777,216 and will color the light from the Sky Beam. The image below shows three different colored Sky Beams. 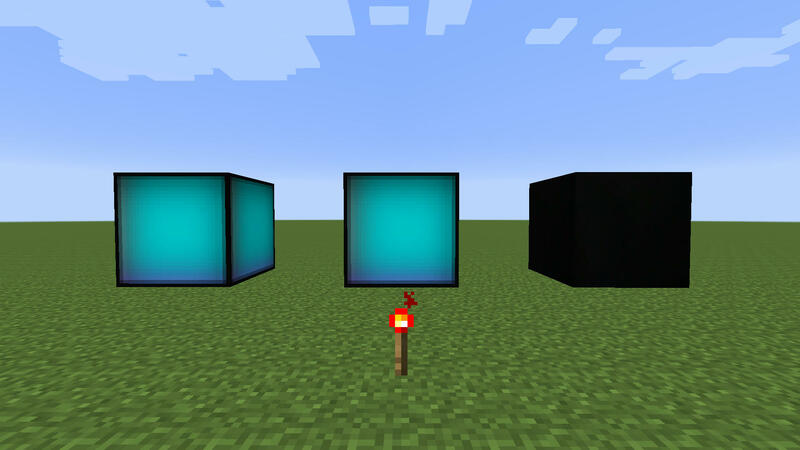 The image above shows a Disco Cube. The Disco Cube is a disco ball but in Minecraft. It needs to below placed on the bottom of a solid block as shown above and uses two block spaces. 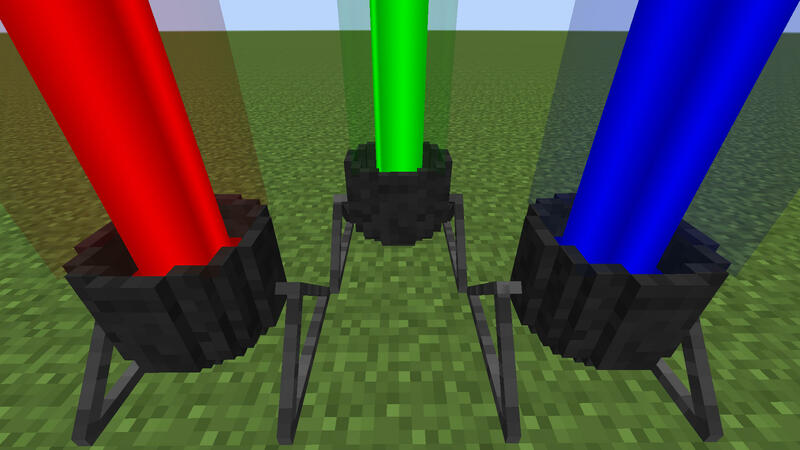 They can be powered with redstone which will cause them to shoot out particles in all directions. They also rotate, the right Disco Cube shows it being powered. The image above shows the Particle Thrower block. The block can be placed in four directions and will face the opposite way that you placed it. 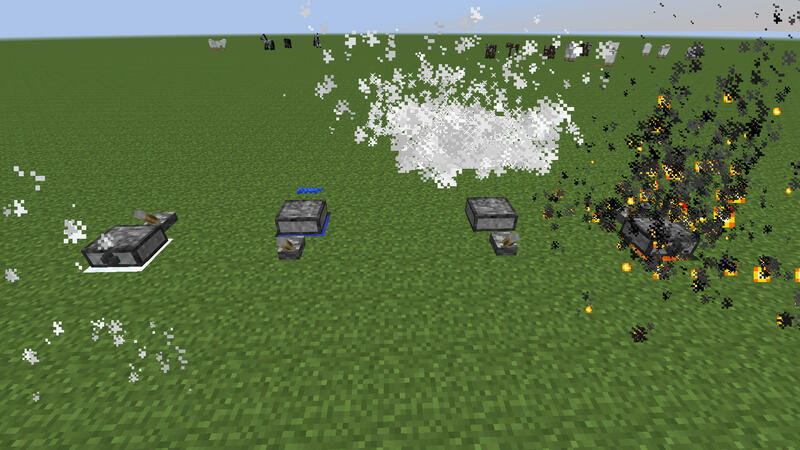 When powered with redstione, they will shoot out particles which can be used to decorate Minecraft. 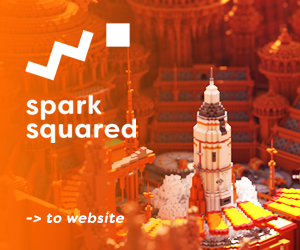 They also can use different particles depending what block is next to them. The blocks are lava, water, fire and snow. When placed next to these, they will display different particles when powered. The above image shows a few of the combinations. 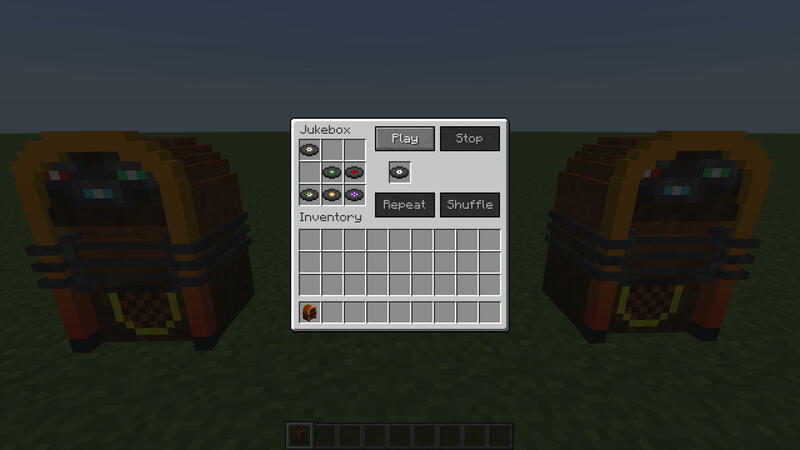 The Custom Jukebox uses two vertical block spaces, the image above shows the GUI and the block model. You are able to right click on the bottom of the Custom Jukebox to open the GUI. 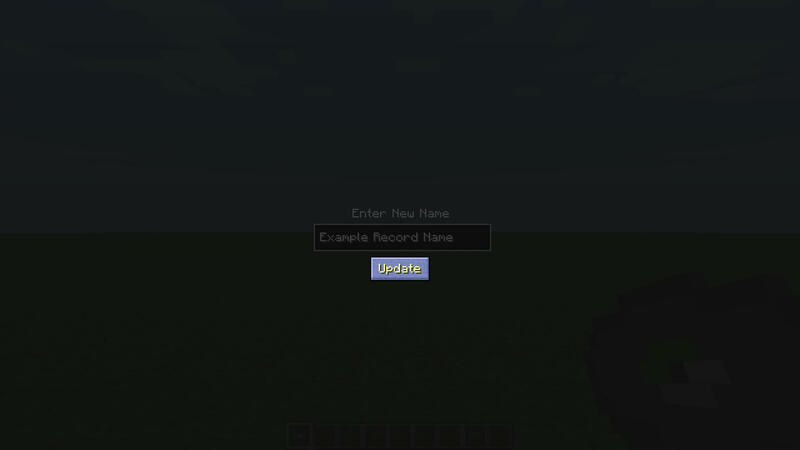 If you are holding a record, custom or Minecraft default, you can right click the top block to play it. The record goes into the slot on the right to play. Use the play button to play, and the stop button to stop. It can also store nine other records in the container. Repeat and shuffle buttons are not yet implemented. All recipes - Download for a clearer image or open in new tab. 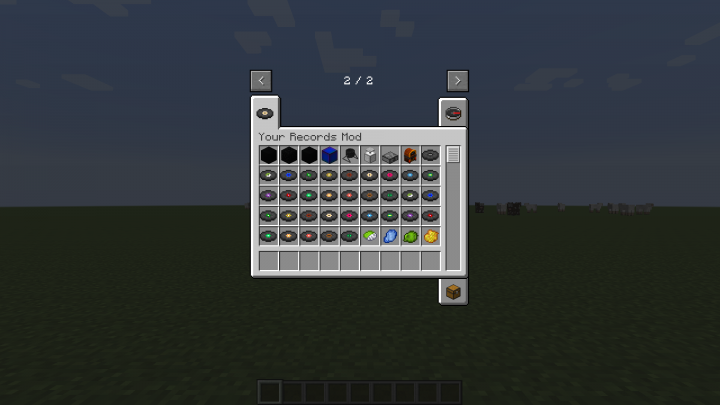 To craft Custom Records 15+ in version 0.7+, place the Custom Records 0 to 15 in the crafting table anywhere and you can get the next records. I give you permission if you want to put up a mod review video, as long as you give credit. Please put the download in the description (this page or my website - arkif.webs.com/downloads). Also if you want to, send me the link and I'll watch it and may put it in this post and drop a like. Please do not put copyrighted music inside the mod when using in a modpack, ask for the creators permission or make sure it's under a license that enables you to use it. I am not responsible if you do distribute copyright material. You may use this mod in your modpack as long as you give appropriate credit. Big thanks to jackdavid12345 for the mod review! Again I am very thankful to all of your comments, views and downloads. I just hit 10,000 15,000 views which I am very suprised with and appreciate all the support, suggestions and views! Thank you so much! Also want to say thanks for all the suggestions again - they helped in version 0.8! By downloading this mod and using it, you agree to the terms and conditions. This mod was created by Arkif (aka Arkif100) and I am the owner of this mod. I may only distributed this mod on planetminecraft.com. It may only be mirrored or reposted with advance written permission of the owner, else it should not be distributed. URL shorteners or other attempts to make money off this mod are strictly forbidden without advance written permission of the owner. You must ask permission for use in modpacks and it is not my duty/fault to prevent copyrighted music being distributed and caught. YES THIS IS THE FIRST MUSIC MOD THAT WORKS!!!! I'd greatly appreciate it if anyone could make me a video showing how to install the mod with sounds and edit the config ;) Thank you. Now the epic music of Monstercat can enjoy minecraft. I just installed this into 1.7.10 and now when I try to play, the game crashes. I even tried making a new world, the same thing happens. Hey, this seems like an amazing mod!! but im always having trouble downloading mods.. and im on an apple mac, any help on how i can easlly download it? Thanks for that! It did help! i will see if it works now. Thanks!! Is there a way to make it so that when you put it in a jukebox, it will say what song is actually playing? There is no way to do this in the current version but I may be able to see if there is a way and add it to a future update. Sorry for the trouble. That's fine, I was just wondering because that would be cool to have. Do you need to convert the music into .ogg or into .wav ? Thanks you :) Again, very cool mod ! I have my .ogg files renamed from "Record 0.ogg" to "Record 17.ogg" and they work fine. Then I edited the items picture (because I like to see the real cd cover) and then realised the .png files must be named "Record0.png" for "Record 0.ogg" (no space before the number) if I want the pictures to match with the music. Hello, I am pleased to hear that you are enjoying the mod. 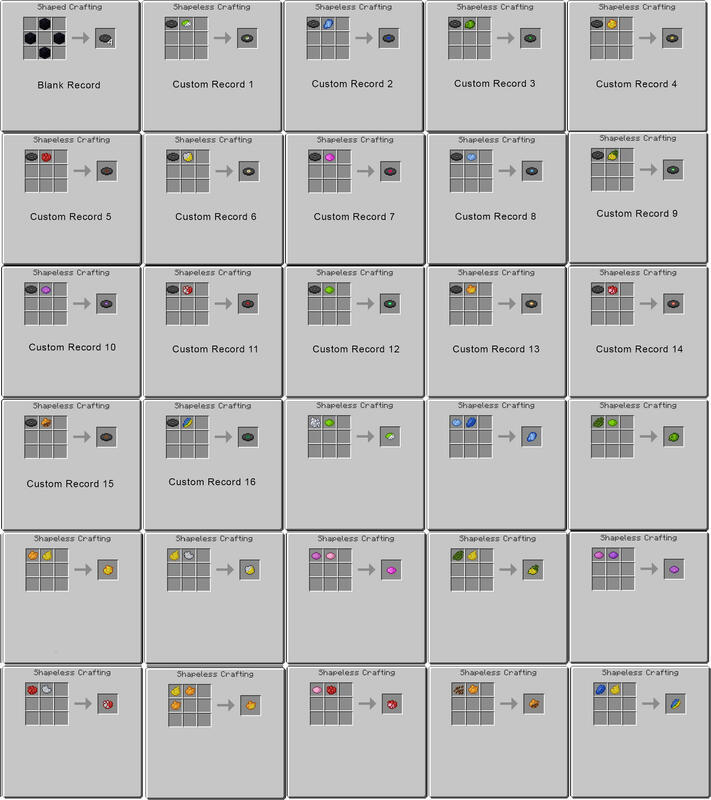 The reason for the textures to only go up to 15 is because there are only 16 textures for the records (0 up to 15). 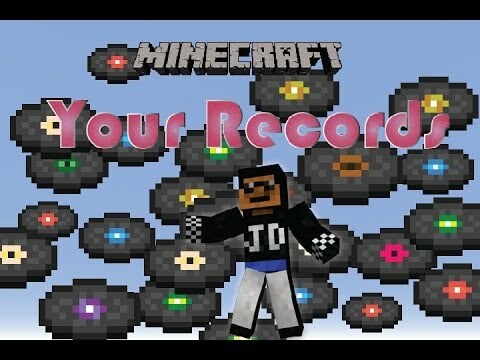 Records that are more than 15 will start to repeat the textures - for example record 16 uses the same as record 0 texture. This is because the config will allow for lots of records and I don't have that amount of textures. I hope this helped to give you a better understanding. The records should be named Record X where 'X' is the number. The numbers should go from 0 to your config settings minus 1. I think some others were also having problems with it playing and I'm not sure why. Try to convert it with audacity, it might be that some online converts are putting it in a format Minecraft doesn't like. Okay, happy to hear it's working. Just updated the version so it should have less bugs and you can now use the v0.8 stuff. Have fun! For those who are having troubles with v0.8: I have just found a big bug with the Sky Beam block and I don't recommend anyone to download it. I will release a patch soon and sorry for the touble caused. For now stick with 0.7.1. I've been having a bit off an issue where I extract the files into my %appdata% but when I start Minecraft up all of them disappear so I am unable to play my music. Are you sure you're extracting them to the correct location? Yes I am sure and I'm following the installation guide that you've put. I've noticed an issue with servers with ComputerCraft, wherein when you play one of the records with the disk drive, it seems to always be the same one. I don't know if it's always the fifth record, if it's simply the last one loaded into the config, or if it's just chosen at random. I'd for example put disc 2 into the drive, and it'd play disc 4. Do the same with disc 0, still plays disc 4. Not a big deal, and I hardly know if you can even support ComputerCraft, but I figured I'd let you know. Ah okay, thanks for telling me. I don't think there is much I can do about that, probably because my records work slightly different than ordinary ones. If your interested: should be releasing an update soon adding more stuff. Sorry that they aren't compatible. Question about the .ogg. I got the ogg file, put it in the place it was meant to go in, and it didn't work. I tried Record 0.ogg but when I went into my world to test it, just silence. Also My volume was at the max and I even tried Record 1 and same results. Any help? It's around 6 min I think, less than 7 min tho. Also, I used the website that was in your file and the website I usually use to convert. I'm using the latest version as well. Btw, I'm on a HP Windows 8 laptop, so I got a question, why is it when I converted to .ogg, it's comes up saying it's a HP Connected Music? Okay it shouldn't be the file length then and neither the website. I have no idea what HP Connected Music is so I suggest just doing a quick internet search on what it is. I have no idea why the mod isn't working for you, does it work in the 1.6.4 version of the mod (using different file formats)? Maybe try to download the mod again as a file could have got deleted, such as the sounds.json? That is very confusing if they worked on your old laptop, it could be something to do with that HP Connected Music. Yes, I guess you won't be able to play the mod to it's full capacity, I'm sorry for the inconvenience. I actually had this issue as well, I fixed it by converting the .ogg file to Ogg Vorbis codec. Actually really easy to do with a tool like Audacity. Yes, make sure your using version 0.7.1 and the config (Your Records Mod.cfg) will be found in the config folder inside .minecraft. To change the amount of records, open it with Notepad++ (or similar software). Then change the number to anything under or equal to 128. For servers, it is recommended to leave it at 128. Hope this helps. The config release came out in the 1.7.10 version of Minecraft, 0.7.1 version of the mod is recommended. Sorry for any inconvenience. So i can't change the configs for the older versions in anyway?? Yes you can, send us a link once finished and I'll take a look for you. Also, should have an update coming out soon if your intrested. I found a bug on my world. I used the OGG converter and I definately did have the right music that I wanted to publish to the file, but it played Record 0 (my first set of music, not the one I'm talking about) instead of Record 1 (the one I am talking about). I don't really know what is happening. Hmm, thats strange. Did you accidentally copy the other one or something similar like that? I haven't had this problem myself but I will double check it and let you know if there is a fix. Hey, love the mod by the way. Just wanted to give you a heads up with an issue that I've been having with the records in case you weren't already aware of it. The issue that keeps appearing is when trying to play records added using this mod in other mod added disc players, e.g. 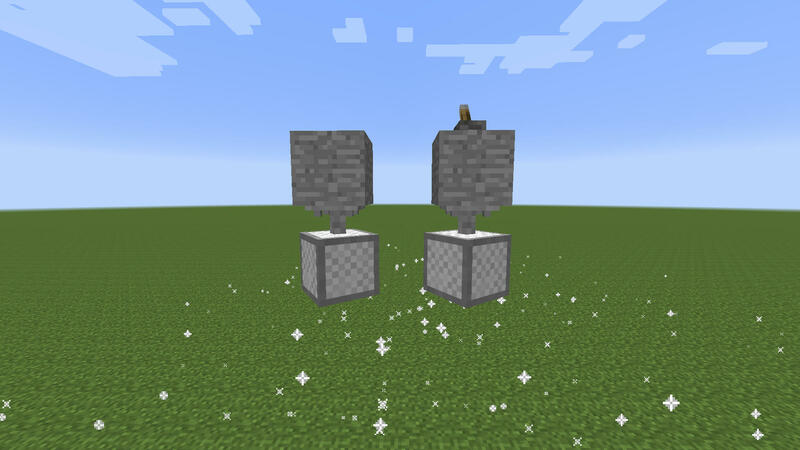 auto jukebox from Minefactory and the computer setup from Computercraft, they tend to have an issue of playing different song files on one disc rather than the file that is supposed to be linked to the disc in game. For instance, song 1 could play file 1 but could also play anywhere between 2 and the last file in the list of .ogg files, but only in other mod added music disc players. It works fine in the normal vanilla jukebox. No prob. Happy to be of help. n_n I'll let you know if I run into any other problems. While The Mod Is Downloading... May I Ask How Do You Download The Music? You use your own music, use a converter if not in the correct format. Thanks, I figured out from a mod showcase that I needed a .OGG file... Mind if I post what links I used to get the file to help people who are as clueless as I was? This is a client side mod so unless you both have the same music on the same record, it will be different for each other. This helps people who don't want others to here their music. It should be the same, give your friend the same .ogg file you are using and tell them to put it as the same record as you.